A content management system (CMS) is a kind of software mechanism which offers websites with specially designed tools for collaboration, authoring, and administration that helps the user to make and handle web digital contents easily. Among several alternatives available, the spotlight is on WordPress CMS, Joomla, and Drupal. All the three covers about 71% of the CMS market share and hence while initiating a fresh website, the user needs to select one of them. CMS WordPress is a kind of Open Source, Online web designing equipment, jotted down in PHP. In the current era, for the purpose of CMS comparison, it is considered as the simplest and preeminent CMS. It is a great tool for creating an elementary website. For people searching for CMS alternatives regarding creating routine blogs, news sites or easy to maintain websites WordPress is an ideal alternative for them. The development process is quite simple and the user can catch a sight of real-time alterations as they alter their website. A pre-loaded plugin and template function is available with WordPress. Convenient for users to use and ideal for amateurs as well as beginners. Approximately 45,000 plugins are available for all kinds of functionality. Various tailor-made alternatives for themes are available in WordPress. Joomla is regarded as an open source CMS available at free of cost for the purpose of publishing web contents. It is an ideal alternative for websites related to eCommerce or social networking, but it needs some core technical techniques. Joomla is created to function as a community platform along with some powerful social networking characteristics. Joomla helps to trail your web content quite easily. For the purpose of Joomla vs WordPress, Joomla helps to develop websites with a greater level of contents and versatility of structure. Joomla is a kind of free, open source CMS. Doesn’t involve vast technical functionality. It offers several themes and templates for developing CMS. It is tough yet an influential content management system (CMS) tool to compare with WordPress. It needs an identical level of understanding just like CSS, HTML or PHP. Drupal is surprisingly an SEO Friendly CMS backed up with clear coding and handy modules. Drupal eliminated the necessity of any exclusive extension of coding (CSS coding). It is well-equipped with several Modules available free of cost. The characteristics of Drupal range from being basic to extensively developed ones. Drupal has professional standardized themes. It has clear codes and handy modules which are preferred by crucial search engines. Let’s strike out the point of difference between WordPress, Joomla, and Drupal, for facts and comparisons login. Most of the individuals developing their website do not belong to the category of professional developers, for the simplicity in usage becomes an essential element. It can be easily installed within 5 minutes. Most of the hosting providers for WordPress content management provides a single click installation process. This makes it simple for initial users to begin a WordPress blog. After installing WordPress, the user has ease of having a well-defined user interface along with lists to develop pages, posts and initiate personalizing looks and themes. The speed of installing Joomla may not resemble WordPress but it has an identical procedure. Yet most of the hosting providers offer single cluck installation alternative for Joomla also. After installing Joomla, the user witnesses a control panel with several click-on and personalizing options for the website. This is great for people who hold experts but for beginners, it becomes a little difficult to comprehend them. Installation procedure for Drupal resembles that of WordPress and Joomla. The user just needs to download and upload packages and work on installation script. Drupal provides distribution channels. These are kind of pre-packed bundles consisting of congregations and modules to make particular websites. Procedures involved after installation is a little complex as the user needs to learn how to alter stuff on their websites. 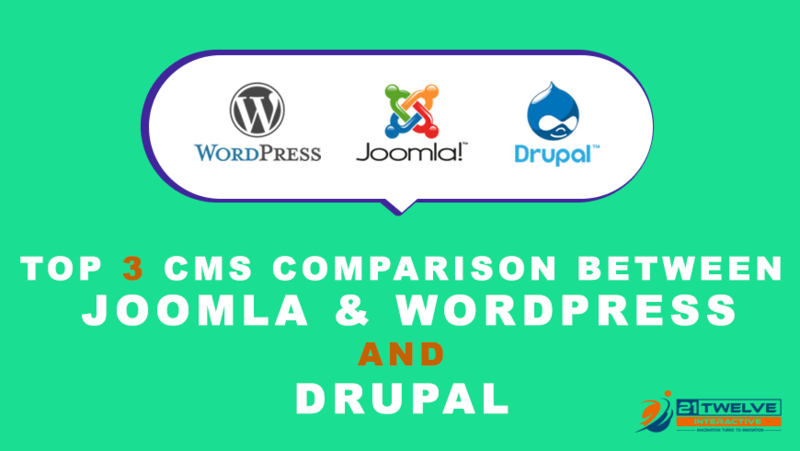 All the three alternatives of the content management system (CMS) that is WordPress, Joomla and Drupal are well-equipped with themes and modules for the purpose of enhancing their properties and looks of the software. By using WordPress, users can easily alter the looks of their website with the help of different pre-loaded default themes. From the appearance section, by clicking on the add new button the user can easily download free themes from its official web page. Some paid themes also available which are built by the third party. It is also well-equipped with several extensions and templates. The user can easily use those templates for handling emails and for e-commerce outlets. Though these themes can’t compete with that of WordPress vs Joomla. The user is not permitted to search and install themes from the admin area. This also faces similar problems with the presence of modules and themes. Users are required to leave their websites, search for themes they need, then place them into zip file URL, after which they enter URL in the theme page. Fresh themes hit the market regularly yet the overall quality is lacking which is enjoyed by the users. For a fresh set of users, a support mechanism is extremely essential. They will definitely face some issues while trying their hands on new software. This is completely alright if they come with proper support and assistance. It has the powerful support of the user’s community. Fresh users can seek help on the codex, docs, official support forums, handbooks, slack channels, stack exchange, and only every possible forum over the internet regarding web designing and building. There exist multiple sites such as beginners which includes tutorials, articles, and videos for users who desire to start working with Joomla vs WordPress. There are several ways a user can obtain WordPress support. Besides the free alternatives, there are some paid options offered by online platforms like Fiverr or UpWork where professional assistance can be employed to resolve the issue. This is also well-equipped with a huge and cooperative community. For beginners, substantial documentation is available on the Joomla website. For an enhanced level of support, users can also seek help from IRC chatroom, forums and such. Users can also seek help from third-party support, development agencies and training programs. In the case of Joomla, searching for reasonable professional support is a tough job. It has an extensive community of dynamic users. The community support mechanism resembles that of WordPress and Joomla. The user can easily get in touch with Documentation, mailing list, user group, and such. Drupal makes efforts in linking users to firms and developers who serve expert Drupal services. A massive proportion of websites developed are polyglot sites. Beginners tend to look for content management system (CMS) platforms which offers support in various different languages. It is an exceptional platform to develop a polyglot website. It has some of the extraordinary plugins that permit the users to simply build a polyglot WordPress website. There are over 53 language alternatives available on WordPress. A fresh set of languages can be easily downloaded by a single click from the administration zone of WordPress. The most famous themes and plugins offered by WordPress are also present in various different languages. Developers are painlessly working to convert these themes and plugins into different languages. All this makes WordPress a leading platform to develop a multilingual website. This offers the facility to offer polyglot websites without any requirement of downloading additional extensions and plugins. The user just needs to visit the language manager, put in the desired content language and carry on developing polyglot content for the website. For administration interface, translations are present which can be downloaded from the administration zone with ease. This is available with a built-in support mechanism to manage polyglot websites. For using them the user needs to make use of translation plugins of contents. After which they can easily add websites and administration interface languages from confirmation zone of Drupal. Protection stands out to be an essential element while selecting a CMS for websites. As websites over the internet are prone to several threats in terms of hacking and such. Being a leading name in the CMS industry, cybercriminals generally reach out to WordPress websites. Although, it has powerful security codes and addresses security issues really rapidly. WordPress vs Joomla offers the facility of auto update of newly developed protection patches. Additionally, websites can be protected using some of the ideal practices such as automated backups or two-factor authentication. It uses a built-in mechanism to display updates for different plugins and themes. This permits developers of themes and plugin to quickly address any kind of security threat. It is very efficient in addressing go any kind of protection threat and offered rapid solutions for it. Although, the user needs to constantly update and manage their websites. There is various add on alternatives present to back up the Joomla websites. The user can nourish the security mechanism of their Joomla websites by trailing similar practice like WordPress. It provides a great approach towards security and protection of websites. They offer protection threats in their personal websites while they are explored and latched. As per experts, Drupal is extensively developed in terms of protection facility than WordPress. It is very handy for beginners, as they do not need to possess any knowledge regarding coding to develop a powerful website which, attracts a considerable proportion of traffic. It can be personalized, protected and simple to localize and collaborate. WordPress vs Drupal is also well-equipped with a huge support community. This option turns out to be a great alternative for users who require a handy yet powerful alternative for e-commerce and social networking. Though it’s learning process is a little tough and has a small support community, it is an ideal alternative for gigantic. If the user strives at developing a massive website with additional properties and boundless personalization, Drupal vs Joomla is the right one for them. It provides great performances but on the contrary, is not appropriate for newcomers. The user needs to go through the properties and potentials of every content management system (CMS) and then choose the most appropriate alternative which works ideally in their specific assignment, websites, and requirements. If they are still not defined regarding one seek help by installing each of the platforms and perform a trial to select the best one among the three content management system (CMS).